Craniosacral is a holistic practice that uses light touch to balance the craniosacral system of your body. The craniosacral system includes the brain, the bones, connective tissues, nerves & fluids of your cranium (skull) & spinal area. The craniosacral rhythm is created by a “wave” of fluid which continuously flows in the space around the brain and spinal cord. The “wave” can be felt anywhere in the body since the whole body is interconnected. Sessions are relaxing at a very deep level. By balancing the craniosacral system, clients may feel reduced stress and improved immune system. For a Craniosacral session, you lay fully-clothed on a massage table. In addition to lightly holding your head or sacrum, I might touch your feet, hips, ribs, heart, shoulders. The session moves slowly, quietly; at first I will “listen” and connect to your craniosacral rhythm. I may hold a position for some time according to what your system needs. Craniosacral is very gentle, soothing and relaxing. You may have a sense of “dropping into” the area where my hands are holding you. You may feel pulsing, energy movement, warmth or tingles. Craniosacral can help heighten body awareness, boost immune system and lend great clarity to any questions that may feel “stuck” to your rational thinking mind. Even if you don’t feel much at first, change may be occurring at a deep level to help you heal over time. My craniosacral sessions are 80 minutes and $125 per session. I am currently offering a specially priced intro package of 3 sessions for $325. I highly recommend committing to a package of three sessions in order to get the most out of your experience. Craniosacral work takes time, and your body will go deeper with each session. 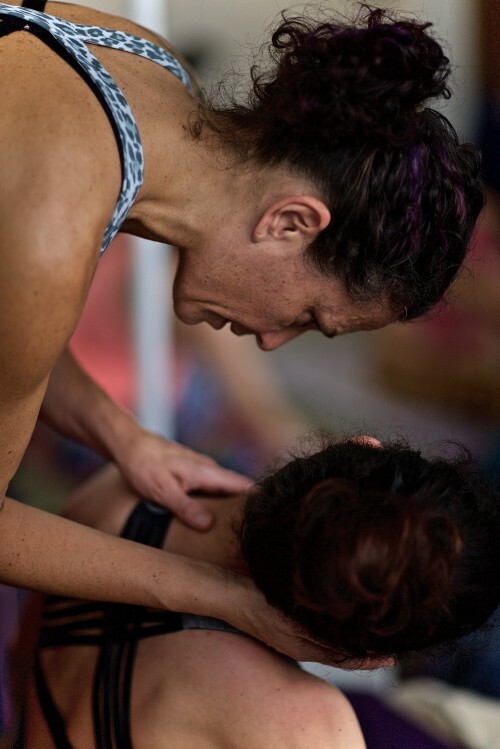 My teacher, Hugh Milne, says “You cannot go too slow, only too fast.” If you prefer an integrative approach you can use your 3 class package in any combo of modalities: expert yoga instruction, craniosacral work and life coaching. Yoga or other mindful body based practices are a perfect compliment to Craniosacral work, and this work is incredibly healing on its own. I’ve personally experienced profound shifts through Craniosacral work alone. However, I do attribute my decades of yoga and spiritual practices for preparing me to be available to get the most out of this type of deep work. In our culture of “doing” and constantly moving and expressing ourselves, the quiet of Craniosacral can be disconcerting at first. You literally do nothing, and the less that you attempt to “do” the better. I will create space for your deeper/wiser self to come forward, in this shared space incredible healing or insight can occur. Craniosacral Work provided by Michelle is not licensed by the states of California or Arizona. Click here to pay for a session. Enter the amount where it says “price per item”. Thank you!